The executive chairman of Spain's Bankia has resigned as it emerged that the government will use public money to clean up bad loans at the bank. 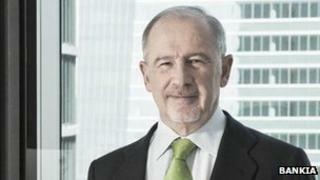 The bank's boss Rodrigo Rato, a former head of the International Monetary Fund, said he had decided "to pass the baton to a new manager to decide what is best for this entity". Spanish banks are still trying to recover from the property market crash. Bankia has the industry's largest exposure to the property market. Spain's fourth biggest bank, it was only created in 2010 from a merger of seven struggling savings banks. The current Spanish government, elected in December, has so far insisted that no public money would be used to rescue banks. But Prime Minister Mariano Rajoy conceded on Monday that "if it were necessary to prompt lending", he would do so "as a last resort". Later, an official from the economy ministry told the AFP news agency, "We are finalising a plan to clean up the bank," referring to Bankia. It is believed that it will need about 7bn euros (£5.6bn; $9.1bn) to repair its balance sheet. The El Mundo newspaper reported that the fact the government was planning on putting money into Bankia was the reason why Mr Rato resigned.